Valad Yar was silent as the ships began to arrive to his small island on Bestine IV, each one carrying the newest members of the Reborn Brotherhood of the Sith. Others were allies and comrades Valad Yar had encountered, and hoped they would become good comrades in the days to come. There weren't many of them, at least not yet. A few Valad Yar had sent word to personally, while others were coming over their own volition. Whether they came knowing what they were to become part of, Valad Yar was certain that today would be the beginning of a glorious new age. Behind him, the large metallic structure that was a small branch of the Exarite Corporation rose from the beach, the sudden change irregular and stark. Within, numerous rooms had been prepared for the gathering, as well as halls for food, entertainment, and learning. Knowledge was always a driving focus of the Reborn Brotherhood of the Sith, and all members would have equal access to the knowledge that Valad Yar had spent the past decade carefully gathering. Stepping off the porch of his small wooden hut in front of the metallic structure, Valad Yar walked to meet his new comrades. Intent: To create a custom starfighter for the Reborn Brotherhood of the Sith, and through purchase, the Jen'ari Empire. Material: Durasteel primary and secondary hull. Quite: The Rogue Hunter is equipped with an aged but still effective cloaking device to allow it to get close and strike without warning. The vessel must decloak to use its weaponry, and it can be detected by a focused scanning system. Missile Heavy: Rather than laser weaponry, the Rogue Hunter relies on an extensive arsenal of missile based weaponry, allowing it to target several enemies at once, as well as fire at long range. Ammunition: Given its general focus towards missile weapons, the Rogue Hunter is not geared towards prolonged engagements, and must disengage after a certain amount of time or risk being overwhelmed. The lasers on board the Rogue Hunter are generally under powered for a vessel of its size. Lone Wolf: The Rogue Hunters cloaking device gives off a certain kind of electronic readings, easily missed by standard scanners when the vessel is travelling along. However, if multiple starfighters are moving together, the cumulative effect can give them away. 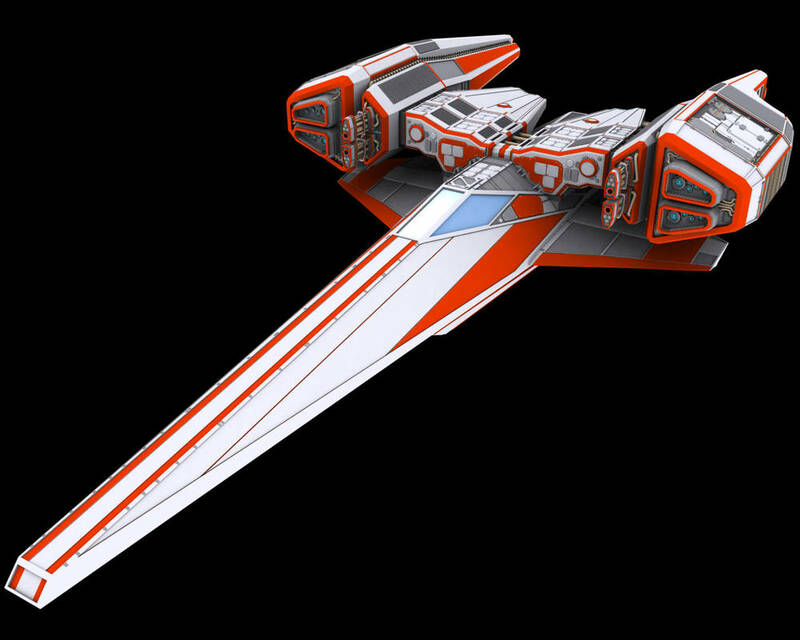 Description: The Rogue Hunter Class Stealth Starfighter is the brainchild of Valad Yar and the Exarite Corporation, designed to give pilots a tactical advantage over almost any foe it comes across, and the ability to get to and from locations completely unseen. Equipped with a cloaking device and several forms of shielding, the Rogue Hunter is well equipped as a surprise assault vessel or a close range support ship, as well as a covert vessel for agents to operate across the galaxy. The first Brotherhood of the Sith was founded by the fallen Jedi Exar Kun, and by his hand the Galactic Republic, and the Jedi Order that served it were brought to their knees. The teachings of Exar Kun would serve as the foundation for many of the future Sith organizations. It was by the hand of his disciples that the Sith Academy on Korriban was constructed. By Exar Kun's own hands, the ancient worlds of the Jedi, long thought untouchable by the Galactic Powers were looted, and their knowledge fully and freely studied for the first time in generations. His techniques and teachings would go on to inspire Sith for the next several centuries, including Darth Revan, the Sith Emperor of the Old Sith Empire, and even the One Sith many years later. Now, that Brotherhood stands Reborn. Valad Yar, an archaeologist from Bakura traveled to Yavin IV, the final resting place of Exar Kun. There, he encountered the spirit of the ancient Sith Exar Kun, and became his first new disciple for thousands of years. Departing Yavin IV, Valad Yar has begun the process of building an organization in the image of the ancient Brotherhood of the Sith led by Exar Kun, calling it simply the Reborn Brotherhood of the Sith. He seeks to spread the ancient teachings of the Sith across the galaxy once again, and recreate the era of Progress and Knowledge that the first Brotherhood of the Sith had forged in the fires of war, and drenched in the blood of all those that stood in their way. Committed to the procurement of new Knowledge and Power at any cost, the Reborn Brotherhood of the Sith seeks to establish itself in a galaxy torn apart in a never ending wave of chaos. Hello! So this is just a little bit of an interest check really to see if anyone would be interested in joining up with the Reborn Brotherhood of the Sith. This is in no way a name grab against the Sith Empire division that is already present on the site, however I have always loved Exar Kun and his Brotherhood of the Sith, and wanted to make it here on this wonderful site. We are open to almost any character here, and are dedicated to the creation and forging of strong bonds and excellent stories dedicated to character building and development. Whether you are a Force User seeking to join the Brotherhood itself, or a Non Force User seeking a bit of employment and credits, a scientist looking for the next big discovery, or an outsider looking for a new home, the Reborn Brotherhood of the Sith has a place for you. If you have any questions, please just ask down below or message me directly! Intent: To create a new generation of the ancient Massassi for use in future threads. Average Lifespan: The average Massassi lives to be roughly forty years in age, with those that go beyond this considered to be ancients within their society. Description: The Neo-Massassi stand nearly two meters in height, and have skin colors ranging from bright crimson to lighter shades of pink. They have noticeable and visible muscles across most of their body. They have sharpened teeth that are almost always on display, and have long tendrils hanging from their faces which grow longer as the Massassi in question ages. Despite their height, most Massassi have a hunched posture, with their heads jutting forward and away from their bodies rather than directly vertical. Distinctions: The Massassi have various shades of red skin, and stand nearly two meters tall. They have tendrils coming from their chins, which vary in length depending on their age. Males are generally taller and broader than females, who tend to have the lighter skin colors in the family. Force Sensitivity: Rare, only a small group of Massassi are Force-Sensitive, bred carefully by the races elders to ensure their bloodlines remain pure. This process has led to a less in quality and quantity of such Force capable individuals, though they tend to live longer than their contemporary brethren. Strong: Neo-Massassi are extremely strong, being able to lift twice their own weight with ease, and able to carry on for long periods of time. Cunning: The Neo-Massassi are brutal, efficient warriors and killers. In combat they are capable of using small and large group combat tactics with minimal communication between members of their warbands. Primitive: Despite attempts to introduce them to newer technology, the Neo-Massassi have a poor understanding and grasp of it. In combat, they shun all blaster time weapons to focus entirely on close range melee weapons. Only a small group of their population are capable of understanding and learning more advanced technology, though these members are regularly hunted and sacrificed by their own kind. Force-Weak: While some members of the species are able to connect to the force, the few that can are extremely weak in the field, only able to do minor things. Diet: Omnivore: On their homeworld of Yavin IV, the Neo-Massassi survive through hunting and gathering lifestyles. On Bestine IV, they rely heavily on fishing and farming activities. Technology level: Primitive, relying largely on stone and basic metal weapons and tools. Some members of the species are capable of more advanced thought, though they are rare and still far below galactic standards. Religion/Beliefs: The Neo-Massassi worship the ancient spirits of the Sith, notably Exar Kun and Naga Sadow. They venerate them, and place them in a Dark Pantheon that they regularly make blood sacrifices to in the form of crippled and defective born Neo-Massassi. General behavior: The Neo-Massassi live in a largely tribal form. Elders make up the leadership of each tribe, with the warriors serving them directly and enforcing their will over the rest of the tribe. Women are highly sought after among the Neo-Massassi, and often tribes will raid one another for the privilege of claiming a mate. Each warrior will only ever have one mate in their lifetime, as females will fight each other for dominance, often leading to lethal altercations. The young of each tribe are cared for by the Elders, who teach and train them for their respective tasks. Once they reach the age of maturity, they are divided based on their gender, with the males becoming warriors, and the females becoming farmer, crafters and builders. Neo-Massassi will attack and violently kill all other species they encounter, seeing everything else in the universe as mere tests of their strength. 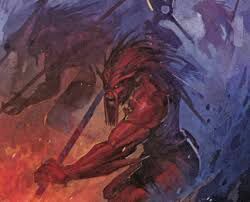 Most warriors spend their time hunting wildlife to feed their tribes, tough they regularly ignore such tasks for days at a time to take part in vicious raids against other tribes. The Neo-Massassi started out as simple survivors. Ages past, the Dark Lord of the Sith Exar Kun sacrificed all the Massassi on Yavin IV to give himself immortal life in the form of a Force ghost. However, not all members of the species were able to enter the temples on the moon to be sacrificed. Some had been wounded in the fighting leading up to the actions of Exar Kun, and survived when the rest of their kind did not. They continued on, surviving in the ruins of Yavin IV, and in deep underground tunnels and caverns. They repopulated slowly over the following centuries, expanding and reclaiming much of the world, though they rarely went above ground, only ever to hunt and farm. Roughly a decade ago, Valad Yar came to Yavin IV where he discovered the new Neo-Massassi, evolved and changed from their ancestors. After fighting off dozens of their warriors, he broke some of the tribes and bent them to his will, though he could not take all of them. What few he could he gathered to him and fled Yavin IV, taking them to Bestine IV where they would undergo genetic changes led by Valad Yar, enhancing their intellect and reasoning abilities. These Neo-Massassi are sent back to the rest of their kind, who recruit their more primitive brethren into warbands that they lead as Elders. On Bestive IV, they live on a small collection of islands near the equator that are uninhabited by the local populace, where they have constructed simple villages where they have continued to grow. So this is a pretty straight forward little post here. I am working on a new project, and am looking to get some help. It is a long term task I have in mind, and there will be plenty of interesting threads along the way, character development, and credits for those interested. Looking for any people leaning baddie for this ladies and gents, as well as any Jedi or other light to grey individuals that might be interested in a little bit of a conversion. If you are interested please say so below or message me directly and I can fill yall in on the rest of the plot.